The single drill bit that does it all! Forged in industrial grade molybdenum steel and heat treated to a 61-63 hardness on the Rockwell scale, these self-starting, laser-marked step bits provide clean and dependable drilling in steel, copper, brass, aluminum, and other sheet stock materials to 1/8" thick.Made in USA. The single drill bit that does it all! 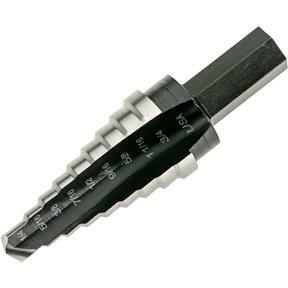 Forged in industrial grade molybdenum steel and heat treated to a 61-63 hardness on the Rockwell scale, these self-starting, laser-marked step bits provide clean and dependable drilling in steel, copper, brass, aluminum, and other sheet stock materials to 1/8" thick.